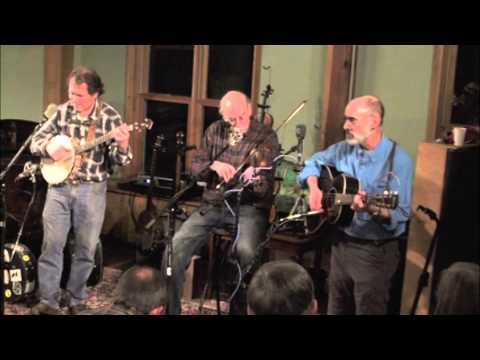 The Sunny Mountain Serenaders comprise three great old-time musicians who play very well together. I have known all three for a long time. Mark Campbell is a Virginia fiddler who has won the prestigious fiddle contest at the Appalachian String Band Festival in Clifftop, West Virginia. Mac Traynham, who plays banjo and harmonica and sings lead has won both banjo and fiddle at Clifftop. John Schwab has played guitar in many great bands and has written a book on old-time backup guitar. John sings harmony. They offer a generous 18 selections on this, their first CD. They rock on Richmond Blues. Mark's fiddle soars through Trouble Trouble from Florida fiddler Arthur “Cush” Holston via Harold Hausenfluck. J. Deadrick Harris from East Tennessee is the source for a relaxed and loping Grey Eagle. Big Bend Gal is a minstrel song from the Shelor family. Their rollicking Shortenin' Bread is from Dykes' Magic City Trio. New River Train takes the words from Fields Ward and the melody from legendary banjo player Wade Ward. The unusual California Cotillion comes from Grayson County, Virginia fiddler Hicks Ring via the Wards and the original Ballard's Branch Bogtrotters. Stackalee is adapted from Mac Snow and Scotty East of Mt. Airy, North Carolina, and Ed Haley from Ashland, Kentucky. Home Sweet Home was learned from the Bell Spur String Band and features a fiddle/harmonica duet. This gentler version of Western Country derives from older fiddlers, such as Emmett Lundy of Galax. This Callahan is from Norman Edmonds. The Girl I Left in Sunny Tennessee is double sourced from the Red Fox Chasers and Charlie Poole. The abruptly crooked Patty on the Turnpike comes from Fiddlin' Powers. Norman Edmonds is the source of Lady of the Lake, a name which has been applied to several tunes. Virginia Bootlegger is the Red Fox Chasers version of an old gospel song which morphs into something quite different. Old Time Fire in the Mountain is from a recording of Dent Wimmer (banjo) and Sam Conner (fiddle) from Floyd County. The melody resembles Going Across the Sea. Waterbound comes from Fields Ward & The Grayson County Railsplitters, which had Ernest Stoneman on harmonica. Moonshiner and His Money is a medley of Money in Both Pockets and Boys My Money's All Gone as recorded by Charlie Bowman and his brothers within a skit. It doesn't get any better than this in singing, playing, and tune selection. I highly recommend this new recording from a new old-time band made of some of the best musicians we have playing today.